Comic-Con draws a crowd of over 130,000 people each year to the San Diego Convention Center. It used to be more comic based, but it's evolved into a massive convention of popular arts which includes comics, TV shows, movies, fiction, and more. There are other Comic-Cons in other cities as well, but San Diego is the largest by far. Going to Comic-Con for the first time can be incredibly intimidating but totally worth it. Here's a series of posts that go through our Con experience. I tend to go into detail, but I hope this gives you a good glimpse of what it's like to go to Comic-Con. This post is a survival guide of sorts and will hopefully help you prepare for your visit. First things first, if you want to go to San Diego Comic-Con you have to go register for a member ID at their WEBSITE. After that, you'll want to make sure you're receiving their emails because that is where you'll find out when badges go on sale. You can get a 4-day pass with preview night, 4-day without preview night, or individual day passes. Preview night is a great chance to go through the Exhibit Hall for your first chance to get exclusive goodies and swag. Some hot items even manage to sell out on preview night. Last year we did not get preview night tickets and we didn't feel like we missed out. It actually worked out for us, because we arrived in San Diego just in time for preview night. Our friends with tickets went to preview night while we went grocery shopping for meals and snacks we could pack during the Con. I found this AMAZING TUTORIAL for making a universal pacifier clip and I knew this was the last thing I wanted to make for my baby shower gifts. It's super easy and can be used with more than just a pacifier. I loved how versatile it could be and how you could personalize it however you want. Visit THE TUTORIAL from See Kate Sew to see all the suggestions and examples. I wasn't able to do much with the ones I made, but next time I would definitely do super feminine ones for girls by adding ruffle and bows and more fun prints all around. This is a pretty straight forward tutorial, but I thought I'd share my pictures as well. Refer back to the original tutorial if you have any questions. After making my stretchy wraps, I was left with a good chunk of scraps so I decided to make a couple of other things for my friends' baby showers. Since my friends were having a girl and a boy, I decided to make a bow tie headband for the girl and a bow tie necktie for the boy. THIS TUTORIAL is a great one that I found to help me. 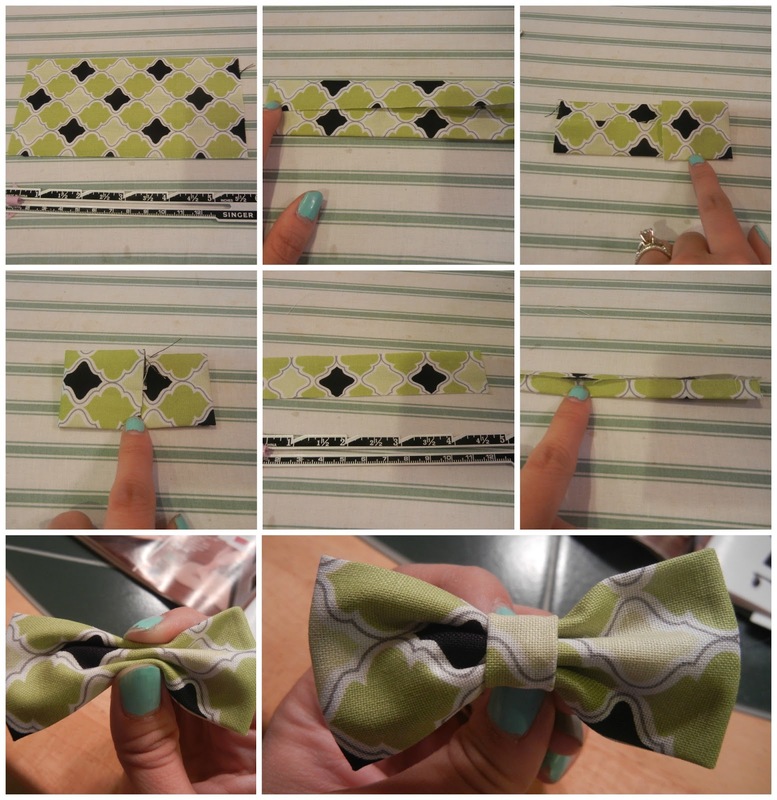 It doesn't involve any sewing at all for the basic bow tie and is very easy to do. This project is also a good one if you have small pieces of fabric lying around since it doesn't call for much.